Fitness Kills by Helen Barer, a Mysterious Review. Review: Helen Barer introduces culinary journalist Nora Franke in Fitness Kills, an agreeable if somewhat ordinary mystery set at a luxurious spa located along the northwestern Mexican coast. Nora, recently dumped by her high-powered lawyer boyfriend, lands a job as a temporary menu consultant at Rancho de las Flores, a resort in Baja California. This position gives her the opportunity to interact with both the guests and the staff. Many of the guests have been coming to the spa on an annual basis and know each other from previous visits, and when one member fails to show up a general concern is raised. He's found at the base of a cliff, dead of an apparent accidental fall. But when another guest is poisoned just a short time later, Nora realizes the two deaths are connected and assumes the role of investigative journalist to discover what the connection was and why someone at the resort wanted them dead. 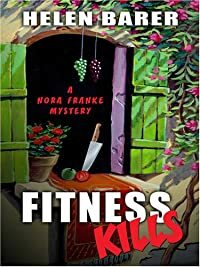 Fitness Kills is written largely in the style of an Agatha Christie Miss Marple mystery. The setting and characters are well drawn and the plot comfortably, if predictably, familiar. At one point, Nora states, after writing an article about her stay at the resort, "I'd given a clear, personal, and if I dare say so, richly textured picture of the ranch and its activities, the guests and staff, and the two deaths." All true. There's even the gruff police officer who, over the course of the murder investigation, grudgingly acknowledges the efforts of the amateur sleuth in residence. But the mystery behind the murders isn't all that compelling, and the subplot involving a Mexican mob is clearly intended to portend an ominous future but ends up appearing contrived and somewhat silly. Nora Franke is an interesting character and the series clearly has potential, especially if Nora is allowed to show more of her investigative strengths. Too often here she plays the victim (both personally and professionally) and seems to stumble through her story. No review of Fitness Kills would be complete without mention of the abrupt conclusion. Many readers will likely wonder if the publisher inadvertently omitted the final chapter or two. It's not necessarily a bad way to end a mystery, but it certainly is unusual. Acknowledgment: Author Marketing Experts provided a copy of Fitness Kills for this review.